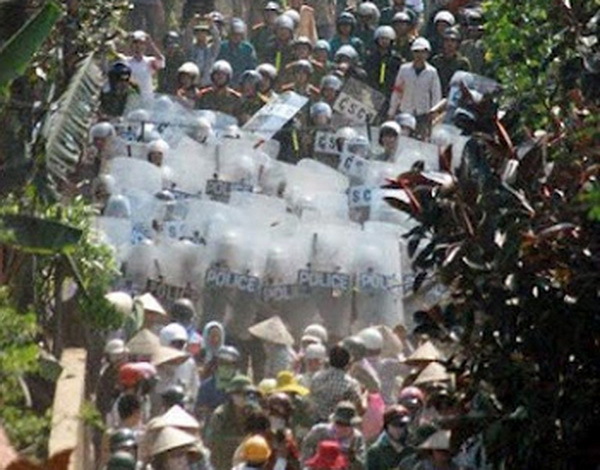 In Vietnam, the “land problem” has many guises. For farmers, it’s a question of the right to work one’s land with the confidence that it will not be taken away except by due process and at a fair price. For developers, it’s a matter of gaining control of real estate on which they can build housing estates, industrial zones, highways or golf courses. For the Vietnamese state, it is a problem that has clogged the courts. corrupted officials and stunted growth. And for the Communist Party, it’s a major challenge as the failure to manage land issues equitably and effectively erodes public patience with its monopoly of power. At the time, Party Secretary-General Nguyen Phu Trong and Prime Minister Nguyen Tan Dung acknowledged fundamental problems in Vietnam’s Land Law. It was announced that the Politburo and Government had resolved to revise the law thoroughly. Drafting work was well underway by the middle of 2012, but not before an incident on the outskirts of the capital cast doubt on the sincerity of the regime’s resolve. Prime Minister Dung had chastised Haiphong City authorities in February 2012 for unleashing police and militia to seize Dang Van Vuon’s fish farm at Tien Lang. Was Dung also dismayed when the provincial government of Hai Duong province deployed 1000 policemen last April 24 to evict a few hundred spade-wielding farmers from fields and orchards on the site of “EcoPark,” a new garden suburb southeast of Hanoi? Apparently not. The master plan for the quarter-billion dollar project in Hung Yen province’s Van Giang district shows an attractive mix of villas and high rise buildings spread over a well-watered, heavily planted 500 hectare site, 20,000 units in all. Its builders may well achieve the “perfect harmony of humans and nature” their promotional literature foresees, for the rich alluvial soils of this portion of the Red River Delta have been yielding bumper crops for at least a thousand years. “Clearing the land” is the core challenge of property development in Vietnam. For the Ecopark project, 3,900 farm families, residents of three villages, had to be persuaded to give up their prosperous farms and move elsewhere. Project developers made Hung Yen province an offer: you deliver us the land, and we’ll build you a 21 kilometer highway. The provincial authorities agreed, but ran into local resistance. By the spring of 2012, delays in land clearance had already put EcoPark two years behind schedule. And, though only 20 percent of the families reportedly had not come to terms, the holdouts were determined to stand their ground. Projects to clear agricultural land for other uses are legion. They fester for years and then boil over when, having persuaded as many farmers as possible to accept the inevitable, local officials send in the police. The crackdown at the EcoPark development might have been a routine story but for three special features. First, though the people who ride herd on the press for Vietnam’s Communist regime warned reporters off the story, the gag order didn’t stick. Second, the seizure of the farmers’ land looked de facto like the government’s intervention into a private dispute between developers and villagers rather than, as argued by the provincial officials, expropriation for infrastructure development. And third, reports (later proven false) soon circulated in the blogosphere, beyond the reach of government censors, that the prime minister’s daughter, Nguyen Thanh Phuong, was a financial backer of the EcoPark project. Five weeks after the incident, Dung ordered the Public Security Ministry to look into the legality of “activities disruptive of public order and assaults on persons with regard to the coerced seizure of land on April 24.” Eight months later, the investigation is still in progress. Groups of farmers from Van Giang make banners and go up to Hanoi sometimes to protest in public places. Sales of $100,000 apartments and $300,000 villas at EcoPark are reportedly brisk. Nor has the book been closed on the Tien Lang confrontation. Early in January, precisely a year after Doan Van Vuon’s family used an improvised explosive device and black-market muskets to wound five of the policemen who were closing in on their 20 hectare fish farm, the Haiphong City public prosecutor announced that Vuon and his three brothers would be charged with the attempted murder of officers carrying out their duties. Three of their wives would face the lesser charge of resisting the same officers. That’s a surprising turn in a case that Dung, the previous March, had termed the result of criminally culpable “mistakes” by local officials, inter alia instructing the Haiphong authorities to institute criminal proceedings against the local officials and to consider mitigating circumstances in judging Vuon. Officials haven’t escaped punishment altogether. Four village level officials will be tried for “destroying citizens’ property,” i.e., leveling Vuon’s house, while Tien Lang District chairman Le Van Hien faces charges of “irresponsibility that caused serious consequences.” Because evidence was reportedly insufficient to prosecute him, district Communist Party secretary Bui The Nghia has gotten off with a demotion, the same fate meted out to many lesser officials. Is this even handed justice? Vietnamese commentators don’t think so, but they’re not surprised either. As with the fracas at Van Giang, the regime’s recent management of the Tien Lang incident is disheartening to those, within and outside the Party, who have been campaigning for fundamental reform of the nation’s Land Law.